Tymon Mellor: Immediately after the end of the Pacific War, the price of graphite, a form of carbon, peaked before declining as the world demand for steel dropped. Following the successful exploitation of graphite on West Brother Island, a number of licences were issued to allow the prospecting for Graphite throughout the New Territories during the 1950’s and 1960’s. Prospecting required minimal financial investment, but confirmation of a find and the investment necessary to develop a mine was significant and in one case, resulted in bankruptcy for the company. As recorded in the Mines Division’s records, the locations of graphite mines and prospecting is shown on the map below. Three general areas were explored; Lantau, North West NT and North Sai Kung. 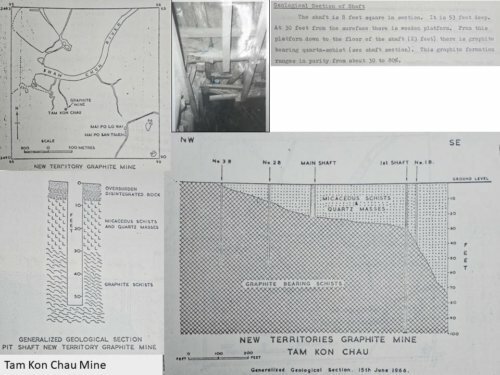 The mining of graphite at West Brother was first registered in February 1952 to the Ng Fuk Black Lead Mining Co, details are described in the West Brother Graphite Mine article. Mining at the site was undertaken under a temporary ‘Mining Licence 007’ and then later under Mining Licence 2/55 and 49/64. 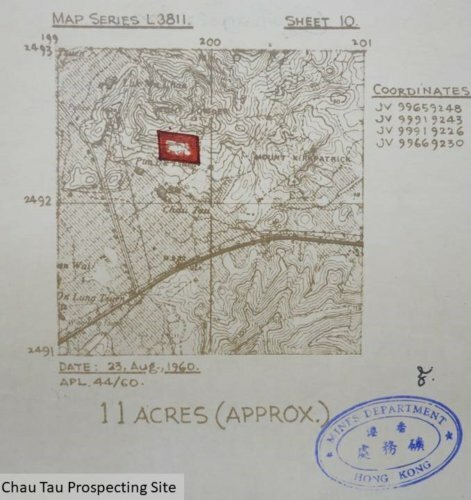 In January 1962 a prospecting licence PL 17/62 was issued to Mr Chuck Yat Pang and Mr Ying Hak Chow of Kowloon to prospect in an area of 20 acres of North Lantau. The site was a headland at Hung Fan Shek, just around the coast east of Tai O. From the lack of follow-up, nothing of significance was located. In October 1952, Mr G M Gillard applied for a licence to mine graphite in the area of Mount Hallowes, temporary Mining Licence 023 was duly issued. 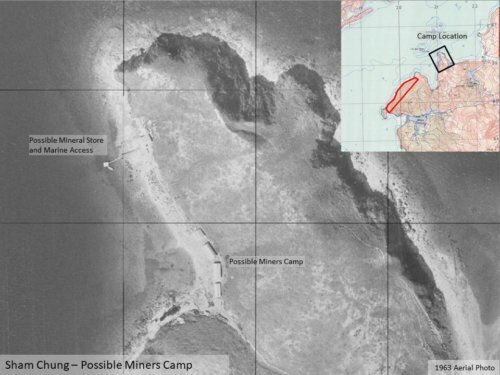 It was noted by the Government that illegal mining was present in the area and due to concerns from the British military, a number of restrictions were imposed. The military was concerned about the security of the Naval Forces operating in the Tolo Channel, and insisted that the storage of explosives should be kept to the minimum and that the licensee could be evicted from the site without notice. The application for a six month licence was approved by the Executive Council on the 3rd November, 1952, commencing 25th November, 1952 and subsequently renewed for two years until 24th November, 1954. I have been unable to locate any record of what, if anything was located within the site. 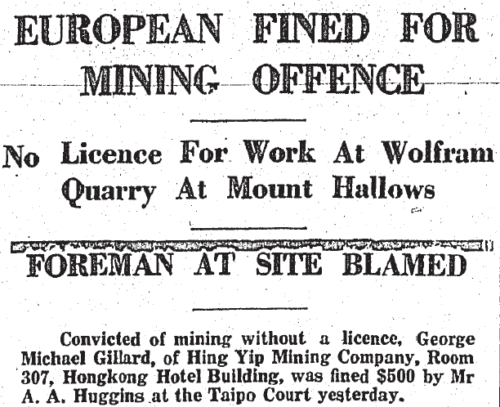 However, the South China Morning Post reported in September, 1955 that George Michael Gillard of Hing Yip Mining Company was found guilty of operating a Wolfram (tungsten ore) mine at Mount Hallowes. The reported noted that his mining licence had expired in November 1954, yet in February, 1955, 40 workers were employed for stone-breaking until stopped on the 21st February, 1955. Mr Gillard was fined HK$500. In September 1955, a mining licence, ML16/55 was given Mr S A Shah and transferred to the Ng Fuk Black Lead Mining Co, the operator of the West Brother mine in March, 1957. The licence covered an area of 40 acres north of Sham Chung. 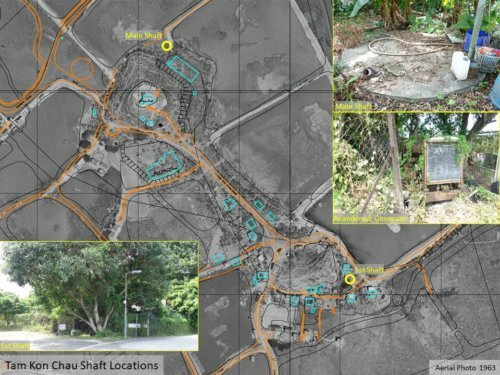 There was a positive anticipation at the find as the 1955 Hong Hong Annual Report noted that “two new areas in other parts of the New Territories are being Prospected [for graphite]”. I have found no on-site indication of any mine workings however, but exploratory excavations must have been undertaken. Intriguingly, on the 1963 aerial photograph of the area, there are temporary looking buildings present on an adjacent headland. This may have been the camp for the miners. A number of prospecting licences were issued for sites in the Mount Kirkpatrick area. There must have been some evidence of graphite finds, but nothing is recorded in the files. However, the current geological map for the area indicates the presence of Graphite in a number of areas. In April, 1966 a prospecting licence PL23/66 was awarded to Au Shui-Kai of Kowloon for Graphite. The area covered the river valley and adjacent slopes. 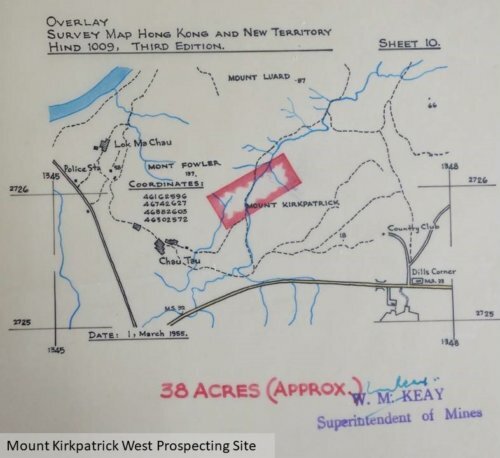 In March 1955 a mining licence application was submitted for an area of the river valley in the Mount Kirkpatrick area. The records do not record who the licence was granted to or provide a reference number, but a prospecting licence was awarded in 1955, PL6/55 to Mr S A Shah and transferred to the Ng Fuk Black of Lead Mining Co in March, 1957, along with the prospecting licence for the Sham Chung site. 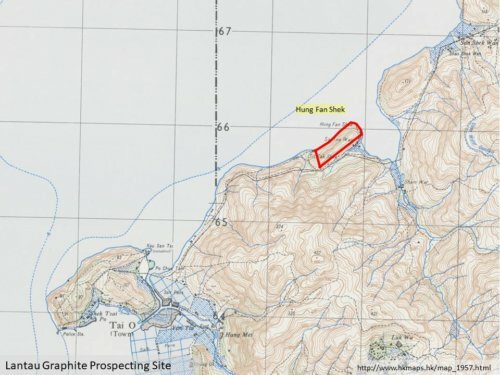 The Ng Fuk Black Lead Mining Co was operating the West Brother mine and was actively looking for new graphite sources, and it is likely that this was one of its sites. 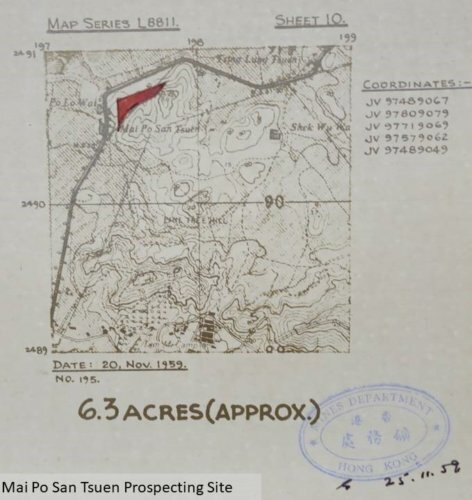 In February 1960, a prospecting licence, APL 44/60 was requested by Mr Wong Yat-ping of Central for an area on the hillside behind the Chau Tau village. The area requested had been adjusted following comments from the British military to avoid a nearby War Department training area. In November 1959, Mr G M Gillard of Kowloon made an application to prospect for Graphite in Mai Po San Tsuen. The boundaries of the site had been coordinated with the British military to avoid a nearby War Department training area. The current geological map indicates Graphite in the area, suggesting something was located, but of insufficient quality for production. Tam Kon Chau is a small settlement perched on a small hillock in the middle of the Mai Po marshes; surrounded by fish ponds, and the boundary fence to the north and the Pak Hok Chau Police Post. The area now hosts the World Wildlife Fund’s Mai Po Visitor Centre. The geology of the area consists of coarse-grained micaceous schists containing large masses of quartz on the crest of the hill. On the flanks are finer grained quartz-schists which are spotty and pink in colour. Occasionally, narrow lenses of yellowish sandstone are present. On the north flank of the hillock, Graphite was noted in the side walls of the water wells, raising the interest in the site. The first mining licence for the area was issued in February 1955 (ML3/55) to Mr Man Kwai Chi of Kowloon. He initially requested the licence for Graphite only, but in August 1957 added the mineral Titanium. 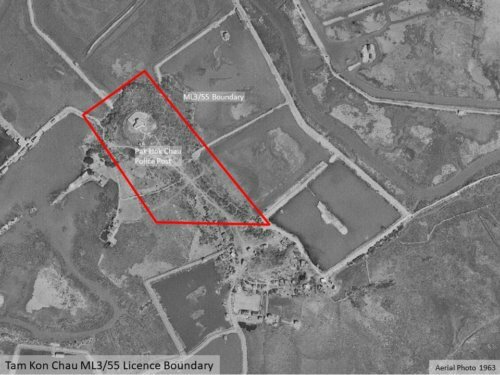 The licence covered an area of 5 acres, in the “mouth of Sham Chun River”. It would seem that he did not locate any minerals of worth. 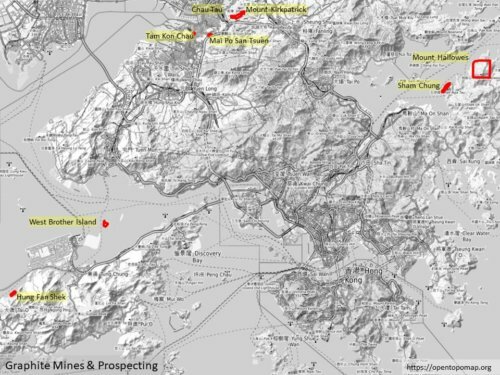 Almost ten years later, in December 1964 a prospecting licence, PL19/64 was granted to Mr Man Kwai-chi, a merchant based in Kowloon for Graphite and Titanium in an area of 2.7 acres in Tam Kon Chau. Mr Man, appointed Mr Stanley K S Yiu to develop and manage the mine. He employed four men and four women to develop the mine and commenced by sinking the “main shaft” in February 1965. By the end of the year the shaft was 16m deep and had encountering Graphite bearing quartz-schist at 9m down. An assessment by Professor S G Davis in March 1966, identified the Graphite as 30% to 80% purity. He also noted that, “By comparison with the irregular fissure vein deposits of West Brother Island this deposit is homogeneous and therefore much more easily worked”. His report concluded, “This graphite is property is the most promising that I have seen anywhere in Hong Kong or South China”. 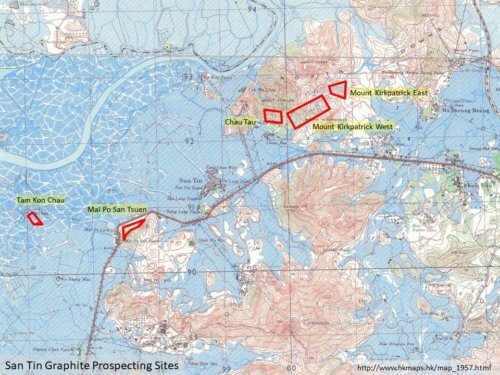 On the basis of an analysis report by Mr Yiu and Professor Davis’ assessment, the New Territories Graphite Mining Co was formed to develop the mine with a capital of HK$200,000. The Directors of the company were Mr R J R Elias, Mr H L Rothstein, Professor Davis and Mr and Mrs K S Yiu, with Mr Elias appointed as the company’s chairman. Mr Elias and Rothstein had promised financial backing of up to HK$1.6 million. 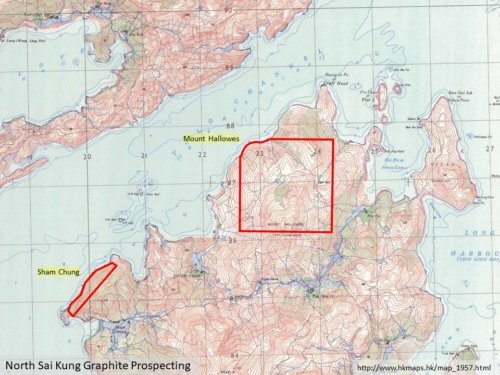 An initial assessment was undertaken on the ore by the Government laboratory, indicating 18% graphite, whereas an independent assessment by Mr H L Yeung suggested a value of less than 1%. Dr Peng of Hong Kong University also paid an interest in the mine, identifying the mine would yield around 626,304 tons of Graphite. The Mr Yeung’s assessment was later dismissed as it was undertaken in a home laboratory. However, further testing showed that the fixed carbon content to be less than 1%. With this information Mr Elias and Mr Rothstein decided in late July, 1966 to suspend operations at the mine and cancelled the order for a Bauers Hurricane Pulverizer machine. Mr Yiu did not agree with the decision, noting that other samples had shown carbon content of up to 18%. He thought it was premature to suspend the works. Dr Peng, visited the mine and took samples for testing, and they indicated a content of less than 2% Graphite compared to 76% from the West Brother mine. On the 9th December, 1967 the Official Receiver took over the company and started the process of establishing the company assests. On a site visit on the 14th December, 1967, accompanied by Mr Yiu, they found a generator and a compressor (both still on the site in 2018). Four workers were maintaining the mine and they were advised that they had been dismissed when the winding-up order was issued. Two shafts had been excavated, one to a depth of 45m and horizontal adits had been excavated. Both shafts were flooded and all the mining equipment had been lost. With the closure of the West Brother Graphite mine in 1973, Hong Kong’s flirtation with Graphite came to an end. As with many industries, cheaper sources were discovered in other areas of the world making Hong Kong’s limited supplies un-competitive in the global market environment. This article was first posted on 7th June 2018.